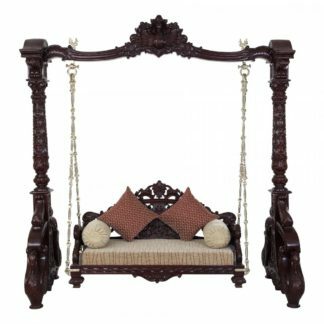 This Wooden Swing is made up of teak quality wood or sagwan wood. The wooden swing has been provided with pure brass chains with no iron screws. 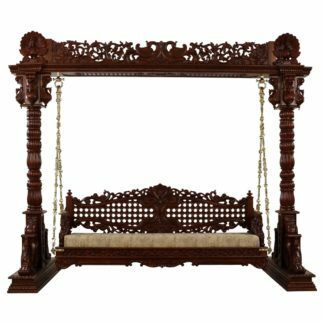 The wooden swing adds style with tradition to your interiors and promises to attract your family and guests like. 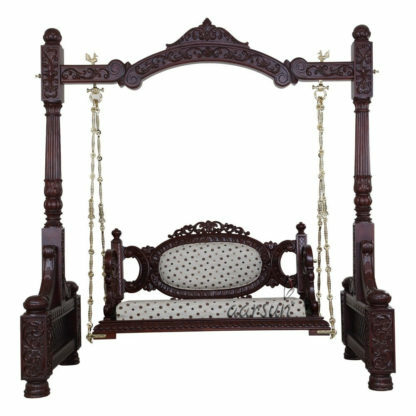 The Wooden Swing is handcrafted showing two pillars and central shaft to give support to the hanging swing. It shows the pillars engraved on the peacock theme. Pillars are erected on a carved pedestal. The Wooden swing set shows two peacock engraved at the base of the hugely ornate pillars having inverted arch design at the top. Indian swing indoor shows a bow shaft connecting the two pillars having peacock shape brass knobs on the upper side and brass hoops on the lower side. 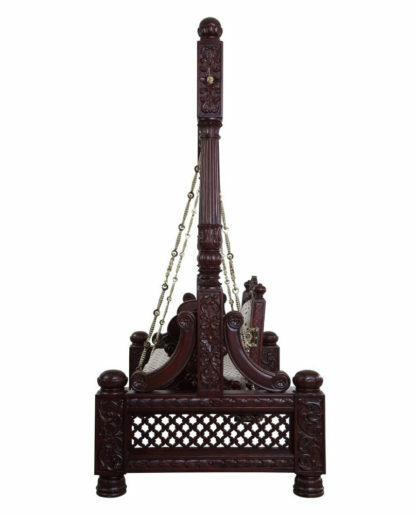 The brass chains adjustable chains supporting the central swing with a carved backrest and hand rest. Swing shows the backrest beautifully embellished on the margins and fabric padding on the central portion. 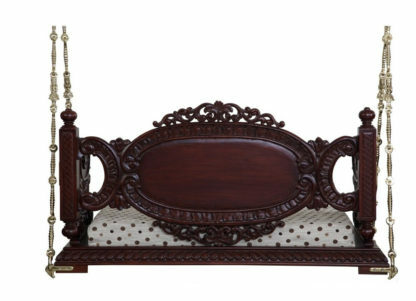 Cutwork design on the hand rest with seating portion comfortably embedded with a fabric mattress pad. There are two bolsters and two square cushions for more comfort. Moisture Resistance: Teak Wood swings has a good resistance to moisture and water.